Online blackjack switch, unlike standard blackjack, gives players the freedom of doing some things that if they could do them while taking part in other games would mean that they’re thrown out of the gaming floor. What do I mean? Think of this situation: you are seated with a friend at a round table inside a casino floor playing real money blackjack. You are both looking at terrible hands not knowing what to do. In fact, it is such tense that the only solution at hand is to do something illegal such as trading a card, which will mean that the card is now playable. But as you well know, such an act will land both of you in big trouble with the management. Interestingly, you are at liberty to do that when you’re playing blackjack switch, a new online version of playing blackjack. In this newest variation, you are allowed to make two real money bets, which will give you the chance to play in two separate hands. Imagine how switching two cards can boost your chances of winning! Although according to many people that make the game somewhat complicated than the average blackjack game. Professional gamblers have argued that it indeed makes the game very enjoyable. They do not understand the reason why many people love playing this variation of blackjack besides Atlantic City Blackjack and American Blackjack Turbo . Rules of playing Blackjack Switch aren’t really different from traditional blackjack. 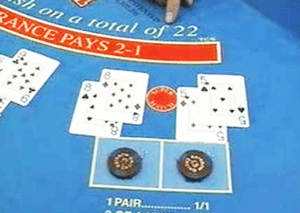 In essence, if you know how to play traditional blackjack, you will not have any much problem grasping the basic concept of playing Blackjack Switch. But before rushing into the first hand on this blackjack variation, there’re a few changes you must beware. Some of these changes are however not so complex. So, take it easy, you will soon fully understand pretty much everything. To start with, at the beginning of each hand, you will be required to make two bets. The two real money Black Jack wagers must be equal and each should be associated with one of two hands. What follows next is the player to be dealt two standard blackjack hands that face up. As is the case with traditional blackjack online, the dealer will be prompted to check for a blackjack, in case the dealer has one. At this time, all bets that the player has, immediately lose. Of course except for blackjacks, which push. After this, the player then has the liberty to decide whether to switch the second cards that are dealt with each hand. Remember though that if the player chooses to, he can leave the second cards and stick to the first option. However, it is an essential thing for the player to try to remember which cards have been switched. This strategy is so because, at this time, the player does not have the ability as in the first case to know which of the four cards have been dealt. The better part of playing Blackjack Switch is when a player makes a mistake in the process of switching. You have the option of freely switching the cards back and forth until you feel comfortable.